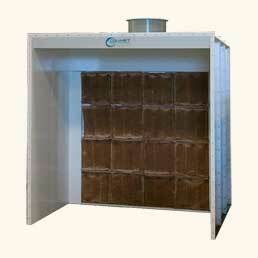 These open front booths are designed for batch-type or conveyorized production applications. Air is drawn into the open face of the booth, across the work area and through the filter bank in the rear wall. Dry arrestor filters trap the airborne overspray particles before the air is drawn through the exhaust stack and discharged into the atmosphere. The booths are available in a wide range of sizes to meet any production requirement. Custom sizes are also available.